Fire Safety week begins tomorrow and I noticed that my 2012 post, Therapy in the Classroom: Part I, was getting many hits. It's not in the title, but the language activities involve fire safety and fire trucks. Find FREE PowerPoint books, a preposition activity, and much more - all links have been updated. At Teachers Pay Teachers, find almost 200 FREE items with a search for "fire safety." 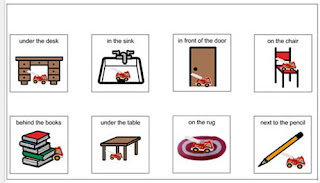 Check out the Fire Safety Vocabulary Cards from Teaching Talking and the Fire Safety - What ifs from Elementary Matters. There are many FREE fire safety apps in the iTunes App Store. Sparky's Match Game is a great activity to remind children to leave the house when they hear the smoke alarm. Sparky's Firehouse and Operation Edith are good apps to project onto a whiteboard. To maximize student language, you control the apps and students direct the actions. Sparky's apps, videos, and much more can also be played on any computer! 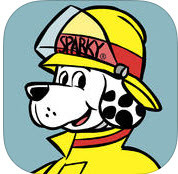 Visit Sparky.org at the National Fire Protection Association's site for kids.